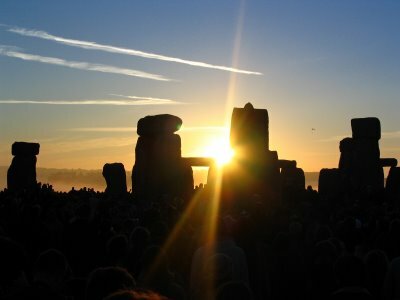 Our friends at the Stonehenge Tour Company have just announced their 2010 Summer Solstice Tour. See itinerary below. Works out cheaper and far less hassle if you are travelling from London. See link at bottom of page. STONEHENGE SUMMER SOLTICE ‘EXCLUSIVE’ TOUR – JUNE 21st 2010 After the huge success of our tours in previous years we are delighted to announce our 2010 departure. Each year on the 21 June visitors from around the world gather at Stonehenge overnight to mark the summer solstice and to see the sunrise above the stones. At dawn the central Altar stone aligns with the Slaughter stone, Heel stone and the rising sun to the northeast. The Summer Solstice is the most important day of the year at Stonehenge and a truly magical time to be there. It’s an ad hoc celebration that brings together England’s New Age Tribes (neo-druids, neo-pagans, Wiccans) with ordinary families, tourists, travelers and party people – 1000’s of them! Due to the nature of this ‘special access’ tour and the strict entry conditions that English Hritage impose please register your interest for this tour on the form below and we will contact you with booking details and terms and conditions. This is on a first come first serve’ basis.